I have my patio pots planted now. Of course I pushed myself to get it done in two days. I’m my own worst enemy when it comes to getting things done. But…I have a pretty planted patio and I love to gaze at it. 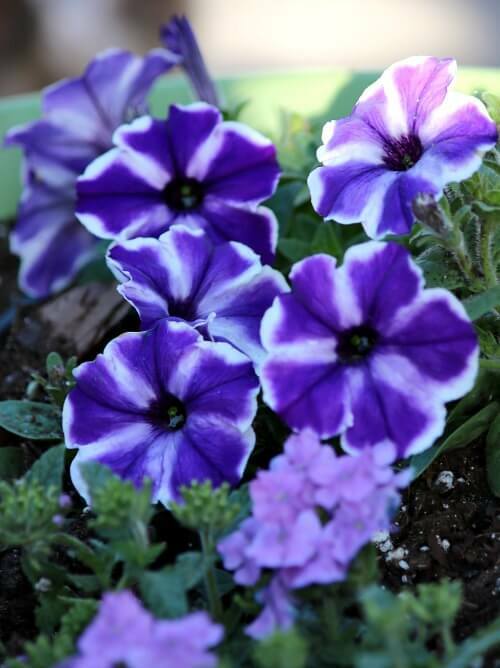 A different shade of purple petunias. 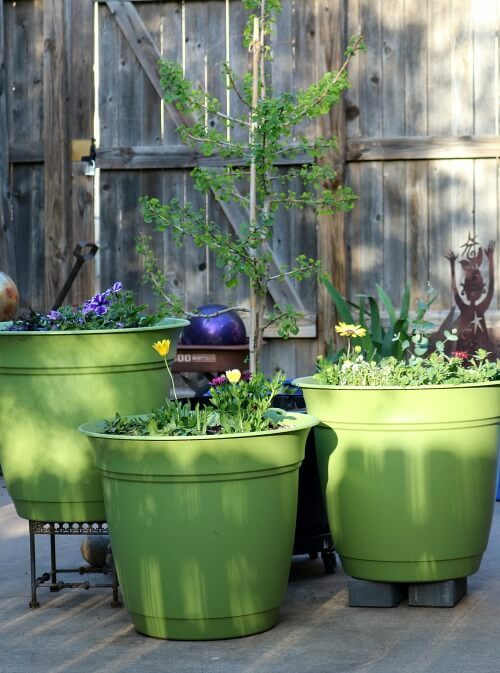 Now I want to tell you a funny story about planting these three green plant pots. It’s funny now but it wasn’t so funny a few days ago. I had a lot of those white packing pellets from when Bella Cor sent me those two big terrariums. So I filled the pots about halfway with those. And then I added potting soil and planted my plants in them. A few hours later I went outside to look at my plants like the gardening fool that I am, and the dirt had caved in. The edges of the soil had pulled away from the sides of the pot. Frankly it looked like three cakes that had fallen flat during cooking. It wasn’t just these three. I planted two fairly big pots with one tomato plant and one cucumber plant with the pellets as well. Same thing. So I had to take the plants out and fill the containers with more dirt and plant them again. What a mess! A close up of Jade’s leaves. Growing fast! There’s my Charlie boy checking things out. I couldn’t find lemon verbena, one of my two favorite herbs. But I found pineapple sage. Charlie ate much of the leaves as soon as I planted it. He often did the same last year. Seems to settle his tummy I guess. I get so excited about planting my patio garden. Well, you all know that! It is a slow growing tree that eventually gets to 12-15 feet tall I read. 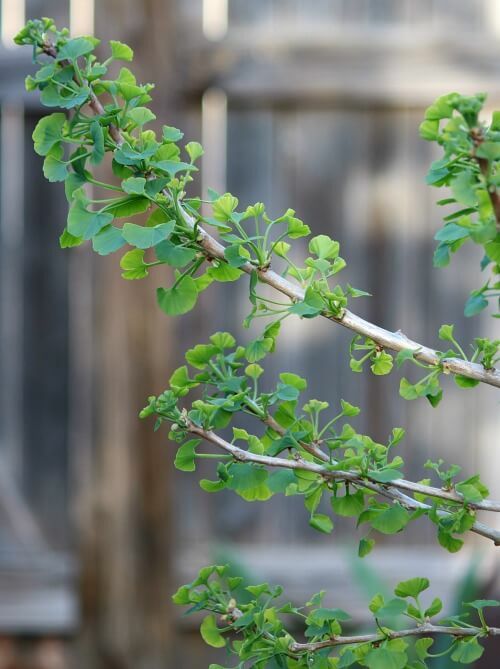 Google Ginkgo Jade Butterfly tree. 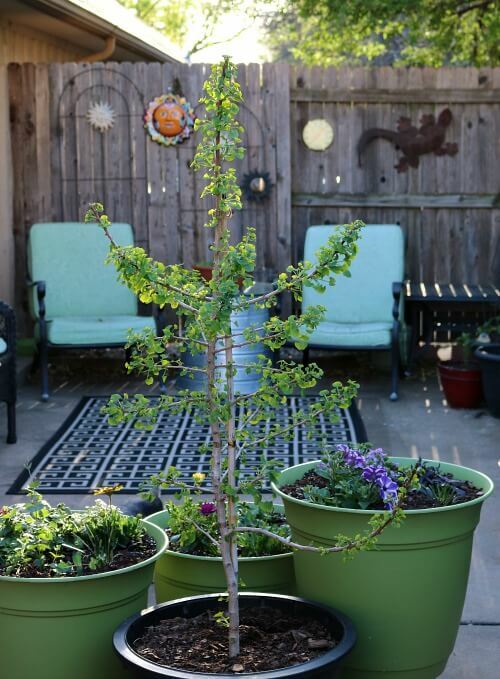 I wondered too about your Jade tree…and yes, the leaves are Gingko looking. Philadelphia, where we lived a few years ago , had many Gingko trees, which we loved for the leaves. Thanks for the name, Brenda and btw, your patio is already inviting. Love those petunias especially the black color. I have not seen the black petunias on sale here at the nurseries but I will keep looking. 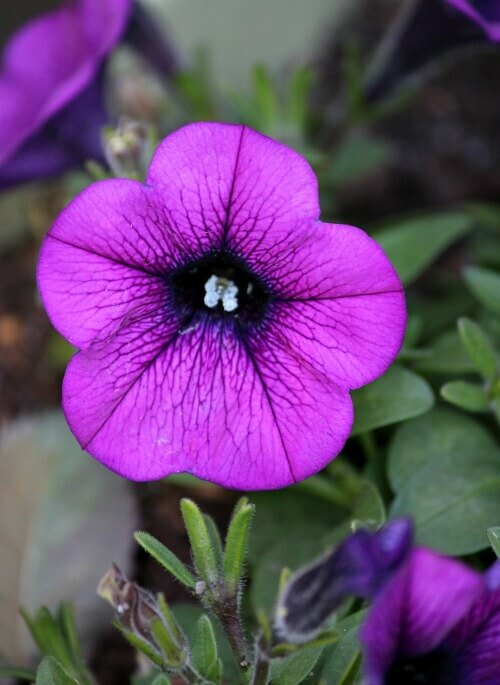 The hot Florida sun makes petunias somewhat of a spring/early summer flower (unless I can find a spot where there is partial shade) so I cannot keep them going during the hottest part of the summer. And that is a shame because I love these flowers. They are so pretty, lush, and soft. Jade looks just gorgeous and almost regal (the princess of the patio)! Looks like Charlie is enjoying the beautiful patio. What a sweetie. He will probably sniff each and every container. I’ll bet he loves the gardening season too. I did not quite realize just what a nice sized patio you have until I saw one of the photos today. Such a great space and obviously a space that you thoroughly enjoy (and especially now during the planting season). The patio size was one of the main reasons I moved here. The patio is the length of my whole apartment, so pretty big. Oh yes, enjoy mine. I love to share! How beautiful…. I feel the same way… just starting to work on all my potted plants on my little deck …. such great therapy !!! Sweet.. sweet Charlie !! The best therapy I think. Reading and gardening are my two favorite pastimes. Love tour garden. The petunias are especially gorgeous. Every year I seem to choose more petunias. I find it therapeutic to stroll around the patio and dead head them. Love your patio Brenda. It looks like such a quiet peaceful place to spend a afternoon just contemplating or reading or even sleeping! I do miss my gazebo sometimes. But I work with what I have. Looks beautiful and will be even lovelier as it grows . Jade looks happy to be there! And I so love having Jade. She was a good choice. it’s beautiful Brenda. i love the aqua cushioned chairs and the black wicker chairs with their aqua seat cushions as well. and the spring green pots . . . and the petunias! it’s going to be a cool and serene oasis for the hot Oklahoma summer that’s coming. Charlie seems to snack on the herbs more than Abi. He seems to know which plants are safe for him to munch on. I watch him when he’s out there. I never just leave them on the patio. And he will go to a plant that I know isn’t something he should eat, sniff it, and pass on by. These are beautiful!! I hadn’t seen spotted Petunias. I love those. I must look for some here in Maine. I like them in my window boxes because the wonderful scent comes into the house through the open windows and the hummingbirds really like them! I had not seen the spotted petunias before this year. I think they only had the purple and white combination when I was at the nursery. Maybe they’ll get in other colors later. Regarding your dirt falling in on those pots with the peanuts. You didn’t use the new type of peanut that dissolves in water did you? Those are mostly cornstarch and would turn to nothing on the first watering. Heavens, I haven’t heard of those! The pots have been watered several days and so far they haven’t lost more dirt I don’t think. Wow. I hope I don’t have to replant all of them again! Little Charlie checking things out is so cute. I have never seen spotted or black geraniums. How beautiful are those. I am so envious that you have your garden going already. The weather here is finally breaking and hopefully in the next couple of weeks I can start my planting too. I cannot wait. Happy Friday and have a beautiful weekend. 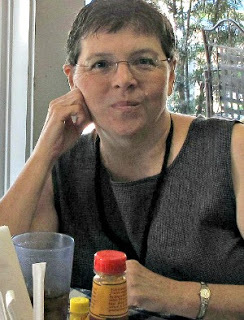 I hope you had a lovely 60th birthday, Kris! I love to create cozy places and spaces, even though I prefer to enjoy it alone with the pupsters. Beautiful! Thank you so much for all the tips! I’ve been planting a patio garden for my mom, using your great tips and so far it’s going great. We’re in Texas so we’re a bit ahead of you. Ah, well I’ve created gardens in Texas. It gets nearly as hot here in OK. 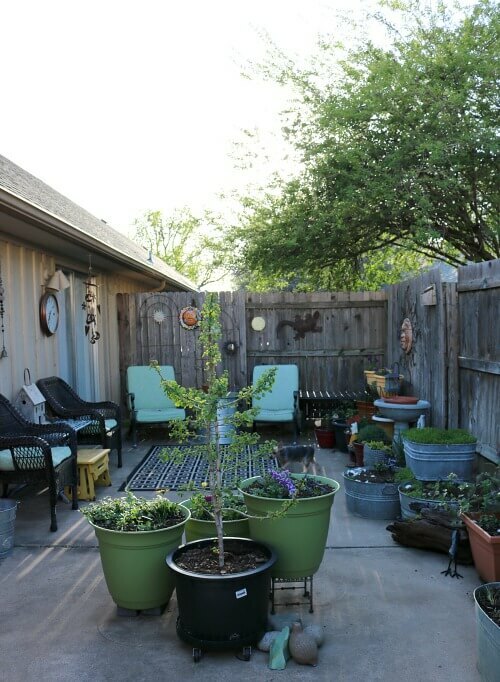 Your patio is looking so pretty, Brenda! 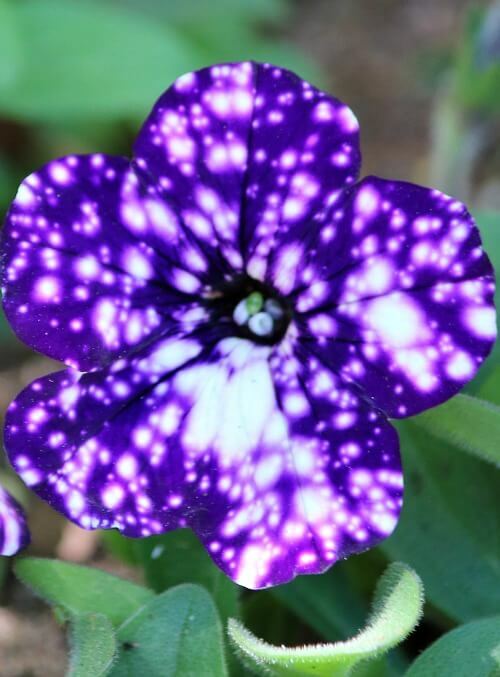 Love the spotted petunias. Don’t think I’ve ever seen those. It is finally almost 60 degrees here and looks like a promising upcoming forecast. This weekend will be very busy with getting the patio furniture uncovered and doing some spring yard clean up. Then hopefully during the week, I will have some time to get to the garden center and start buying some flowers. Can’t wait! I know. Last Monday when I planned to visit the nursery, I woke up at 4 a.m. and couldn’t go back to sleep I was so excited. Felt a bit foolish, but that is life for a gardener like you and me. Oh it looks wonderful, Brenda!! Are those big green pots new this year? I see you went with the purple and yellow color combo again – it will look so fabulous as the season progresses and things fill in! Our weather looks like it may finally turn towards spring this weekend and I can’t wait to get out there and get more garden beds cleared out! My body will be sore but my mind will be happy! Yes, those green pots are new this year. I showed them in a post about the cheapest pots that size that I found. They are from Home Depot and were $9.99 each. Jade is so beautiful. Now I’ll have to get some striped petunias so my green eyes will turn blue again! Cheers to a new gardening season! Jade is looking great! I am like your other friends in that I have never seen spotted petunias, either – I will have to go looking for some as they are quite beautiful! BTW, I put the filler peanuts in a plastic Walmart bag, tie it at the top, put it in the large pot, mash it down and then using an ice pick, punch a few holes in the top all the way thru the bottom of the bag so water will drain thru. Makes the peanuts more solid so the dirt won’t co-mingle. Thanks for the tip. Why didn’t I think of that? Such a pretty outdoor patio Brenda! Well done! I’m feeling excited and a little overwhelmed thinking about our garden this year. We try to have our vegetable garden planted by Mother’s Day, which seems to work well in the PNW. I had great success with using peanuts by covering them with scraps of shade cloth. That held the dirt in place but let the water slip right thru the mesh . Easy to pick up edges of cloth at summer s end and dump dirt if I wanted to save it..I used shade cloth to cover aluminum cans when I used them instead of peanuts. I love your patio! And Jade and the petunias are especially pretty! I planted a lot of petunias last year and really enjoyed them. I hope to be able to start planting in my containers in a couple weeks. Should hopefully be warm enough by then! Spring has been so slow in arriving this year. It all looks spectacular, Brenda! I love those petunias! You really must have worked like a little beaver to get all of that done in two days! Not to mention having to do some of it twice! It all looks very inviting–a lovely place to sit and read or just relax. I can’t believe that it’s been warm enough to do all that planting because only the last couple days have been warm at all here. I hear it is supposed to warm up next week some. The first of this past week we had snow flurries a couple days in a row! I sure hope that’s the last of them I see for this season. My daffodils are blooming next to the house, though, which cheers me immensely. Have a great weekend sitting on your patio! Your patio is looking fantastic. I too wondered about those lovely green pots. Thanks for mentioning them up above. I will have to see if our HD carries them. 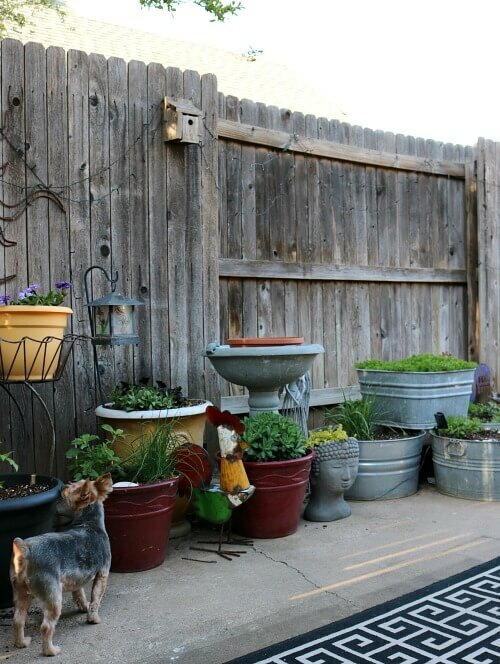 Enjoy seeing your patio garden every season. What type of rug do you have outdoors and where did you purchase it? Looks so pretty! 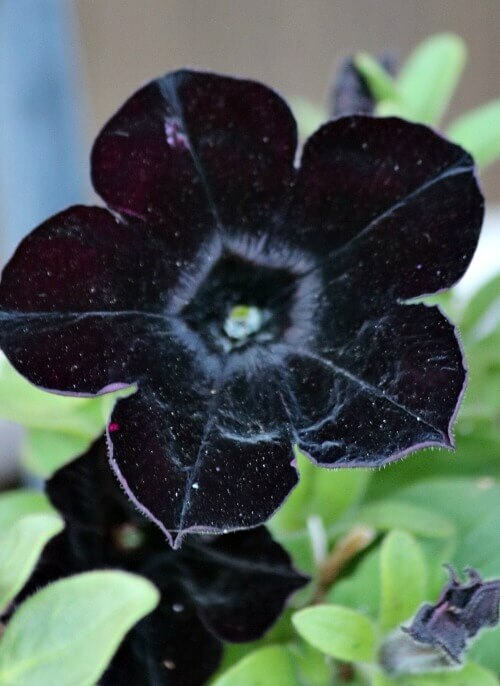 I have never seen spotted or black petunias. So pretty. I hope I can find those this year.